Tasteful accompaniment throughout by both Michael Rooney (harp) and Jen Kommnick (guitar). After a recording debut with the much acclaimed McNamara Family's, Leitrim's Hidden Treasure, Brian McNamara is back with a lovely solo effort. 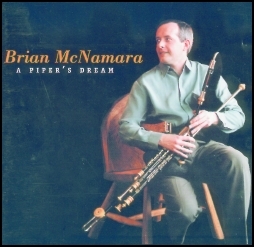 A Piper's Dream features the repertoire and historical piping of Brian McNamara's native South Leitrim, complemented by several classic tunes from the Irish piping tradition. Brian's renditions are thoughtful and precise, displaying his thorough mastery of the music and the instrument. Lively duets with sister, Deirdre on the concertina and several evocative slow airs round out a fine recording. Tune listing.